Origin and Habitat: Mascarene Islands (Mauritius, Réunion and Rodrigues). Habitat: It grow at low elevation usually up to 600 m altitude. Description: Dictyosperma album is a medium-sized palm and the sole species of this monotypic genus. It has a beautiful swollen crownshaft and ornamental arching fronds. The most distinguishing feature, is that the newly emergent leaves stand as vertical spears. It is commonly called hurricane palm for its ability to withstand strong winds by easily shedding leaves. This is quite a variable palm. Trunk: Solitary, ringed, often with numerous vertical cracks in its dark grey otherwise smooth bark, with a slight bulge at the base and up to 20(-24) m of height in its native range, but often less than to 12 m elsewhere and up to 16 cm in diameter. Crownshaft: 70-110 cm tall, swollen at the base, and covered in white wax (hence its epithet album) and small, matted brown hairs. However the colour of the crownshaft is quite variable ranging from green, to white, yellow, grey or brown. Crown: Rounded 4,5 m wide and 3 m tall. Leaves: 20-30 in crown, arranged spirally, pinnate-compound, 2,5 to 3 m long, borne on short 15-45 cm petioles; Rachis 2-2,5 m long; Leaflets, 50-70 on each side of the rachis, lancelote, perfectly and closely spaced, arching or drooping, pointed at the apice, from 60-90 cm long, dark green in a single plane. Inflorescences/flowers: It is a monoecious (male and female flowers on the same inflorescence) palm. It produces up to six inflorescences up to 1 m long, which ring the trunk below the crownshaft, branched to one order and looking like a horse tail, or rooster tail; Flowers white to yellowish-brown, both pistillate and staminate flowers have three sepals and three petals, the former being smaller than the latter. Fruit: Ovoid, 1,5-2 cm x 1 cm, purple or black with one seed and not edible. Seed: Brown, ellipsoidal irregularly ribbed. 1) Forest & Kim Starr Dictyosperma album (Red palm, common princess palm, hurricane palm). Plants of Hawaii. <http://www.starrenvironmental.com>. Downloaded on 21 August 2014. Cultivation and Propagation: Dictyosperma album is an easy to grow palm that likes sandy soil, but is adaptable to clay and loam both slightly alkaline and acidic. Good drainage is also important. Dictyosperma album vary in shape. Specimens raised in dry and/or infertile soils tend to be smaller in stature with smaller leaves. Light also affects the plant's form while those grown in full sun are more compact. 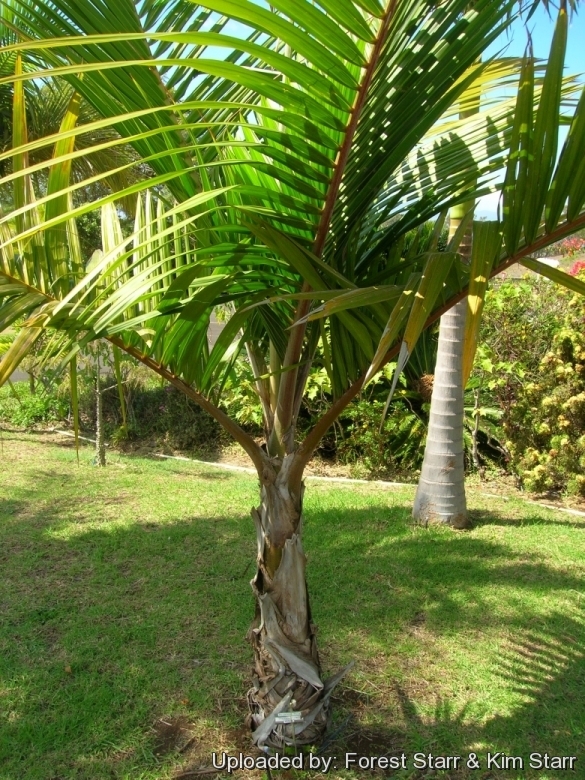 When grown in optimal tropical climates they are among the fastest-growing palms. Fertilization: Need a perfect fertilizer diet including all micro nutrients and trace elements or slow release fertilizer. They are not prone to micro-nutritional deficiencies especially on soil with a high pH. Watering: It is quite drought tolerant, but enjoy rainy climates and proved to tolerate a wide variety of conditions. In areas where summer rain is prevalent, it seems to put on rapid growth with this ample water, but it does not want to sit in continually wet, mucky soil. The roots and lower trunk can rot if soil is kept too moist. Hardiness: It can grow in subtropical or even in perfect microclimates in temperate areas ( it resists to temperatures close to the 0°C only for short periods), but never to the effect it has in the tropical climate. (USDA Zones 10B-11 and 12 (truly frost-free regions) . One possible trick for raising these palms in a warm temperate climate (the warmer the better) is to plant them among other leafy plants, like flowering gingers, bananas, or bamboo, which raise the ambient humidity and create a more-favourable microclimate. Aerosol salt tolerance: It is exceptionally salt-areosol tolerant. Wind tolerance: It is called the hurricane palm because it can suffer strong winds (usually) without being destroyed. They have come through Category 1 hurricanes without damage. Its exceptional resistance to hurricane-force winds is due to The individual fronds that fold back to form an inverted "U" and help in that regard a lot! Remarks:This palm likes a hight atmospheric humidity and does not thrive in areas where there are constant drying winds and perish quickly if exposed to dry hot desert winds. Maintenance: It is self cleaning, so no ugly browned-out fronds to either "get used to" or remove from the trunk, via chainsaw, as with the Washingtonias! Roots: The root system of this species is very sensitive and good sized specimen is extremely difficult to successfully dig and transplant to another location. Uses: Either as a single specimen or in groups, this is a strikingly beautiful species. Its very neat appearance and stature makes it perfect as an avenue palm. Culture in containers is possible although growth rates are slower. A bright patio will provide an excellent environment for young specimens which can eventually be planted in a sunny location. It is urban tolerant. Plant 3-7 m apart as a street tree and they can be planted beneath power lines due to slow growth and small size. Food uses: Dictyosperma album is valued for its excellent palm heart. Medicinal uses: In the Mauritius a root decoction is used as a diuretic. Pests & Diseases: They are quite resistant to pests/diseases typical palm tree pests like aphids, they are only moderately susceptible to lethal yellowing. Propagation: It reproduces by seed which germinates in about 2 months.